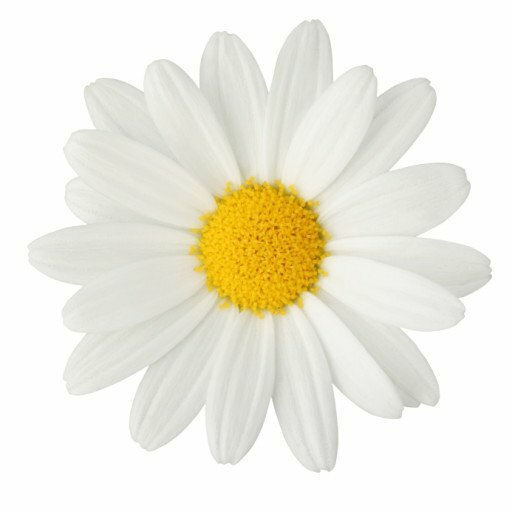 Want to give a gift that keeps on giving? No, I’m not talking about sunchokes, Helianthus tuberosus. Instead, consider making a homemade bird bubbler that will be popular with resident and migratory birds and fulfill your wildlife requirements. 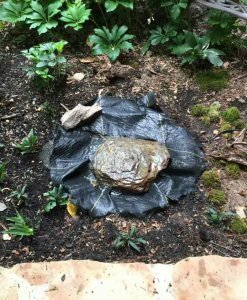 Although a birdbath will do, moving water adds additional value. 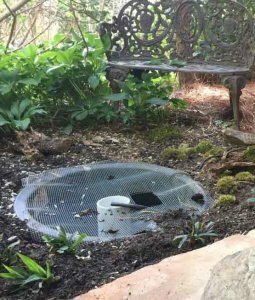 While birdbaths are useful, and the Bee Better Teaching Garden has several, a constant source of clean water is paramount for our birds. Did you know birds are three times more likely to die in winter from the lack of water than from the lack of berries and seed? For our resident birds, still water, like that in a birdbath, works well if cleaned often. Resident birds are familiar with their turf—where the berries are, seeds, fruit, and water. However, what about the migratory birds? In unfamiliar territory, the sound of the bubbler will direct birds to the source. While resident birds are also attracted, the sound ensures migratory birds can find the water as well. Moving water also stays cleaner. There are two main reasons for this. For one, the pump circulating the water aerates, helping to clean as it moves, and two, the reservoir tub capacity is significant, so debris falls to the bottom. For this project, I used a 20-gallon capacity tub, but the container can be any size. Greater than 20-gallon capacity is helpful so re-filling isn’t required as often. The tub should be emptied by diverting the pumped water away from the tub and cleaned every year or two. – Choose a site with electrical power. I put mine right off the back porch so I can sit and read or write while listening to the soothing sounds of bubbling water. 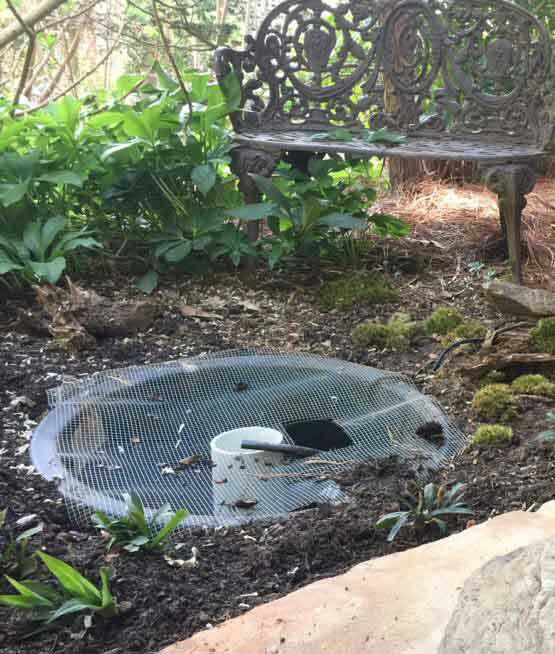 – I used a round, 20-gallon pond tub, found wherever pond supplies are sold. Pond liner material will also work. – One or two stackable rocks, each drilled with a hole. The number of rocks will depend on how high you want the stone to be. Our stone had subtle undulating surfaces to create tiny pools where the birds could bathe. – One 4-foot long, 3/4-inch exterior diameter, 1/2-inch interior diameter vinyl tube. – One 3-inch diameter PVC pipe cut 1/2-inch shorter than the depth of the reservoir tub. While one standing pipe works, three or more is more stable. – A galvanized woven 1/2-inch mesh, which is a thicker and more sturdier version of hardware cloth. – Electrical cord rated for outside use. – Submersible fountain pump rated to 120 gallons an hour. 1. Excavate the soil to the shape of the tub. Dig deep enough so the tub is about one to two inches above the soil to keep rain from washing in debris. 2. Set the PVC pipe upright (vertical) in the tub. 3. Put the pump in the bottom of the tub. Attach the vinyl tube to the pump output port. This tube will be threaded into the rock to supply the bubbler’s water. You might need to place. You might have to place rocks on and around the pump to hold it in place when it is submerged in water. Just make sure you do not block the pump’s water intake. 4. Run an electrical cord rated for outside use from the pump to an exterior outlet. 5. Add the galvanized woven cloth over the bubbler area to give the desired shape of your tub, making sure to cover it so debris doesn’t fall in the tub. 6. Cut an opening in the galvanized woven cloth, in an area near the pipe, but not on top of the PVC pipe, allowing the pump to be inserted into the tub and maintained as needed without completely dismantling the bubbler. 7. Fill the tub with water. 8. Place the landscaping cloth over the mesh so debris doesn’t fall into the tub. 9. And now for the hardest part—drilling the 3/4-inch hole in the rock(s). The easiest way to do this is with a hammer drill and a new drill bit. 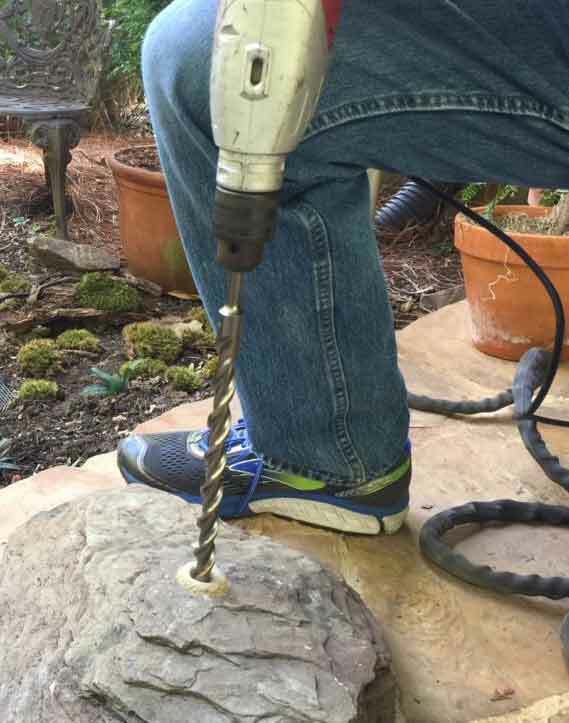 We don’t have a hammer drill in our arsenal of cool tools, so our regular drill had to do. It can be done, but with much patience. Patience isn’t my forte, so I asked my hubby to help. I don’t ask for help often, so when I do ask, he knows I need it. 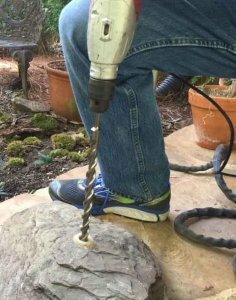 So if you don’t have a hammer drill, or a regular drill with a willing partner to help, have it drilled professionally, or make new friends and ensure they own a hammer drill. 10. Place the large rock on top of the area, after you thread the vinyl tube through the bottom of the rock. This tube supplies the bubbling water. 11. 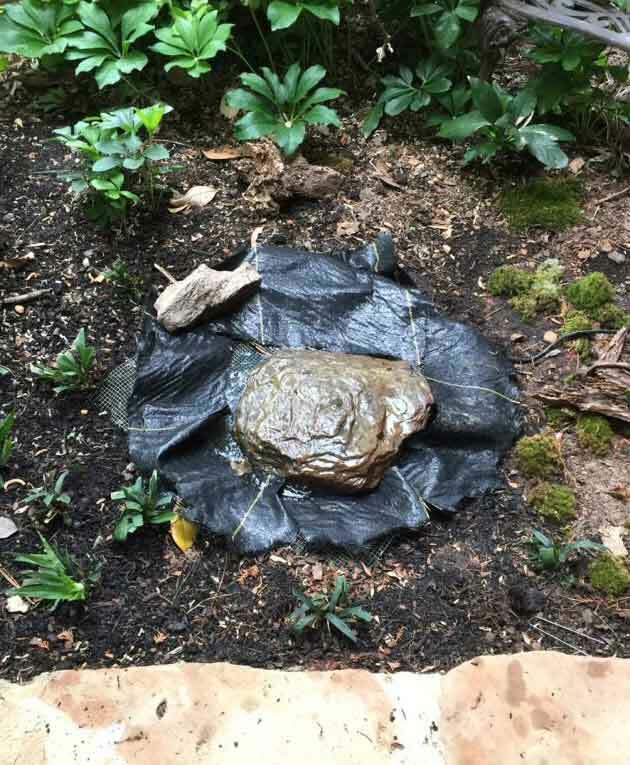 Top dress the area with river rock or other materials to give the bubbler a natural look. Now, with the sound of moving water, you will keep your resident birds happy and draw in the migratory birds as they are passing through.